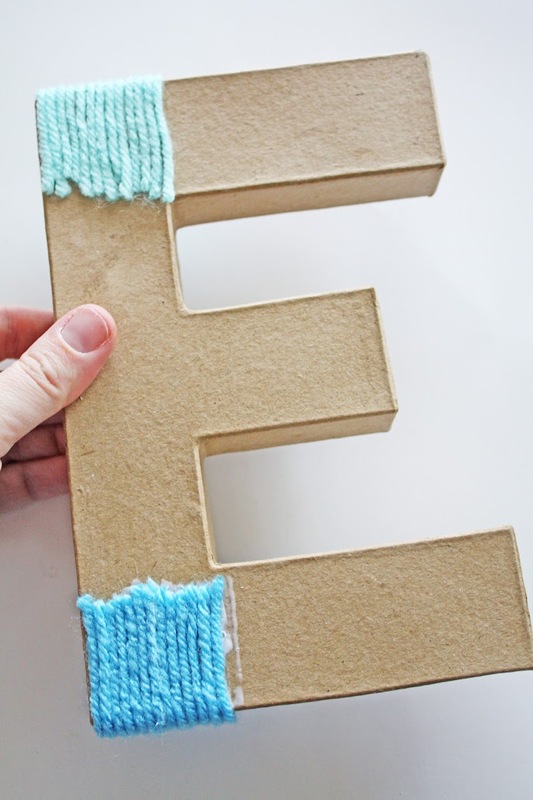 One of our most popular DIY crafts of all times is how to make a pink yarn wrapped ombre monogram letter. So we decided to make a blue yarn wrapped ombre monogram letter to give you an idea of how cute and versatile this can be, too! 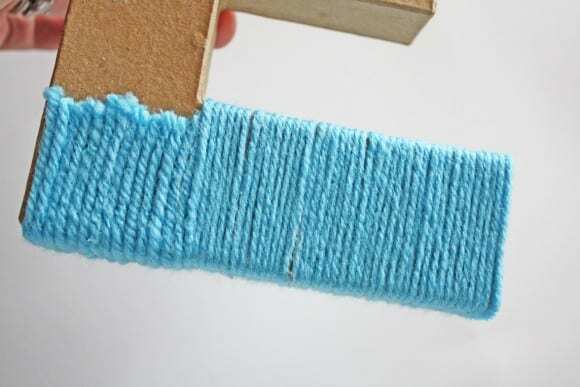 Step 1: With the lightest color at the top corner, start by covering the small portion that cannot be wrapped around. Repeat for the bottom with the darkest color. See photo for example. 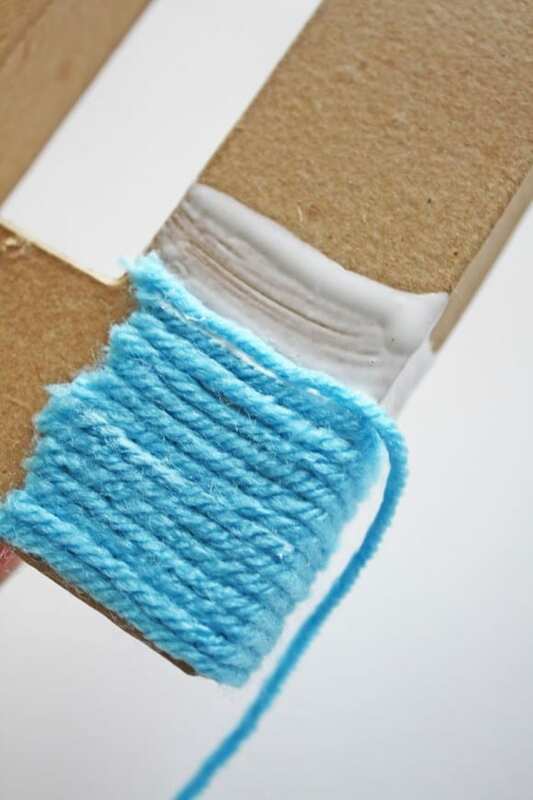 You can first paint on the Mod Podge in the area you will apply the yarn or use a dot of hot glue to hold the yarn in place before wrapping; both ways work. Step 2: Complete wrapping each arm of the “E” or horizontal portions of your letter in a vertical manner. I applied the Mod Podge to one area at a time when wrapping the yarn. I also used a dot of hot glue occasionally to keep the “tightness” of the yarn in place while the wet glue dried. Only apply the Mod Podge to one side of your letter. 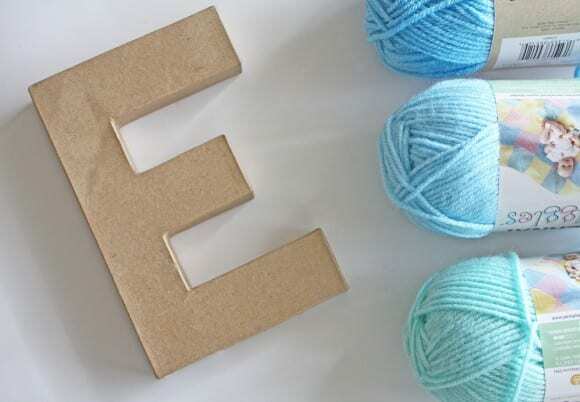 Step 3: Once the “arms” of the E are complete, begin wrapping the yarn in the horizontal direction. Lightest color of yarn at the top, medium shade in the middle and the darkest yarn at the bottom. 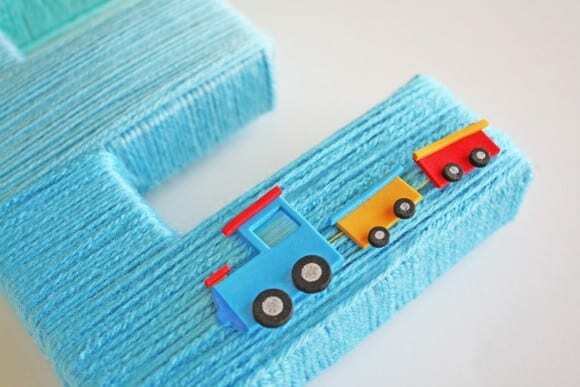 Tip: Make sure to pull tight on the yarn and wrap slowly to create a nice clean, even finish. Step 4: Add cute scrapbook sticker embellishments. I added a dot of hot glue to hold them in place. 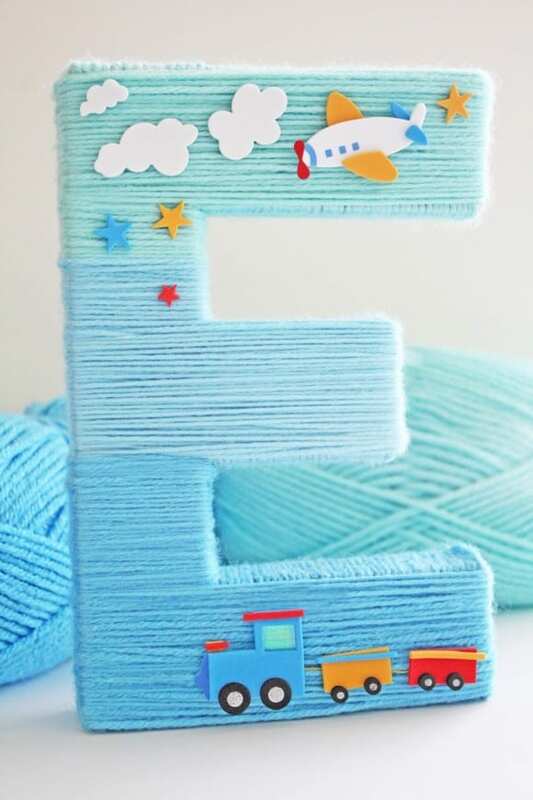 These yarn wrapped letters make the perfect baby shower, boy 1st birthday, or nursery decor! And the best part is you can customize your own colors and embellishments. 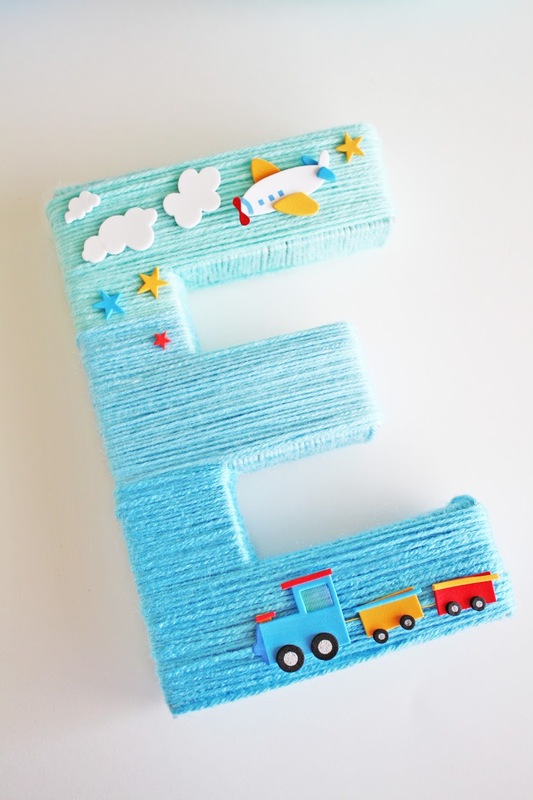 The letters are easy to make, but they do take a bit of time so plan ahead! They will make the perfect baby shower centerpiece or homemade gift for the new mom to be. 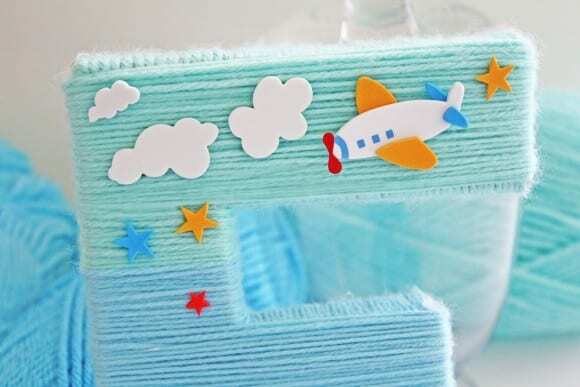 For more inspiration, check out these boy 1st birthday parties and boy baby showers on our site! This fabulous craft was created by our style and craft contributor, Shauna at Ella and Annie Magazine! To see more of Shauna's work, check out Ella and Annie Magazine and visit them on Facebook, Twitter, Instagram, and Pinterest. This is such a fun idea that can be used for any party theme or style. I have covered paper mache letters in the past with moss and loved hanging it in my bathroom to bring some nature indoors. 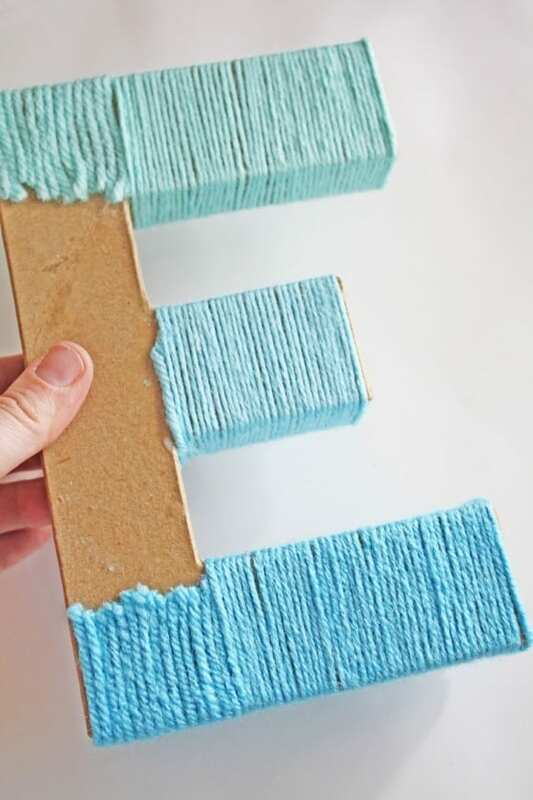 I love the idea of doing this for a party and then being able to reuse that same decor for a child's bedroom perhaps. What a great way to reuse the decorations. I always hate feeling like I'm just throwing away all the hard work I have done for a party.